Central Life Sciences has relaunched StrikeProducts.com. 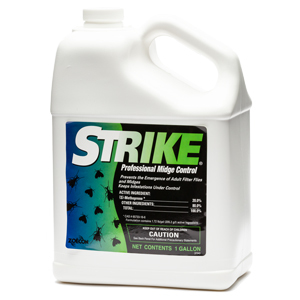 Strike products are used primarily in wastewater treatment facilities, but they can be applied in any facility or site seeking control of midge and filter flies in water on the premises. Potential sites include wastewater treatment facilities, chemical plants, pulp and paper facilities, food processing facilities, golf courses, parks and resorts. The environmental compatibility of all three formulations make them a great solution for controlling midge and filter flies. The new website highlights the various use sites where Strike products can be applied, and provides easy access to informational resources.